Preheat the oven to 190ºC/375ºF/gas 5. Dissolve the beef stock cube in 400ml/14 fl oz of boiling water. On a medium heat melt the butter in a pan, add the vegetables: onion, carrot, celery, garlic, thyme and bay leaf and sweat for 10 minutes or so until softened but don’t let them colour too much. Now add the beef mince and cook until brown, a matter of minutes. Add in the tomato purée, Worcestershire sauce and Tabasco then stir and cook for about 2 minutes. Turn the heat up to high and add the red wine. Let it bubble away and reduce for a few minutes, now add the stock and reduce to a medium heat. Simmer for a further 20 minutes, giving it a frequent stir. Time to cut the potatoes into even halves and quarters, cook in a pan of boiling, salted water for about 15 to 20 minutes, until cooked. Drain in a colander and set aside. Taste the mince and season to taste with salt and pepper. Transfer it to an ovenproof dish (approximately 20cm by 30cm). 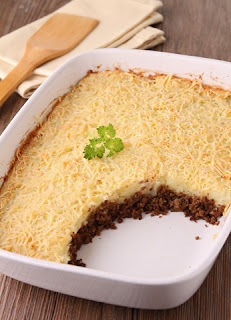 Mash the potatoes with the butter, milk and a pinch of salt and pepper then spread over the top of the mince. Finely grate over a little Parmesan cheese then cook for 45 minutes, or until golden and bubbling. Serve with buttered peas, another seasonal vegetable or a side salad of choice.